Please ensure that you have used kilograms and centimeters only! Failure to do so may result in additional charges added to your shipment. Do you know the collection and delivery postcodes ? Please click here to enter them for our very best prices. Are you sending a pallet ? Save Money - up to 75% off standard rates! No Hassle - Instant quotes. Instant booking. It's easy. Prices start from only £27.00 + VAT per pallet and on average, ParcelLink customers save up to 70% when sending large consignments. 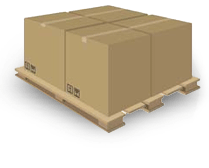 For pallets and larger consignments, you won't find cheaper rates anywhere else. "I think the website is looking great and easy to use , I would definitely recommend to others "
"Great website, quick and simple to use, highly recommended. " Since 2004 Parcel Link has been helping businesses reduce cost and increase productivity by creating tailored parcel and pallet delivery solutions for your business. 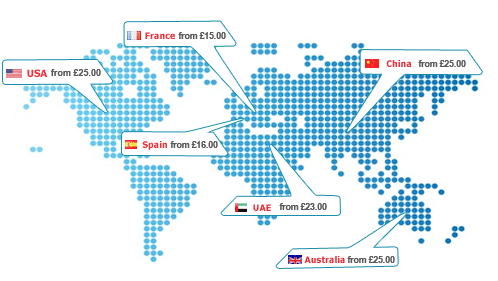 Since 2004 Parcel Link has been offering customers discount parcel delivery services to any destination worldwide. In recent years, in addition to our cheap parcel delivery we have been adding pallet delivery services and other freight services for the collection and delivery of large consignments. We can handle consignments of any weight and size going to destinations like the North America, Europe or Australia. We specialise in providing a speedy and reliable service to small businesses and individuals in the United Kingdom that are looking for an affordable solution to their delivery needs, regardless of destination. Whether you are interested in express shipping to the Far East or you need to make sure that a package arrives to the Middle East on time, we can help. We offer a wide variety of services at prices that compare favourably with those of our competitors and we are always willing to help our customers choose the most suitable option for their needs rather than the one which is the most expensive. If you are sending parcels or pallets to or from London, it is worth checking the latest travel guides and information on the Transport for London website. If you are sending a package to Germany, Portugal or Sweden and you are looking for the most cost effective way to get it there on time, our online quotation and booking system enables you to make all the necessary arrangements with the minimum of fuss. We understand that our customers wish to ensure that the items they send arrive undamaged and in good time, at the best price possible, and we go out of our way to meet their needs. From small parcels to pallets, our cheap shipping to France, Spain, Italy or any other European destination can be booked at any time of day or night. In the near future you'll be able to get quotes, make a booking and do much more from your mobile via our fully mobile site.